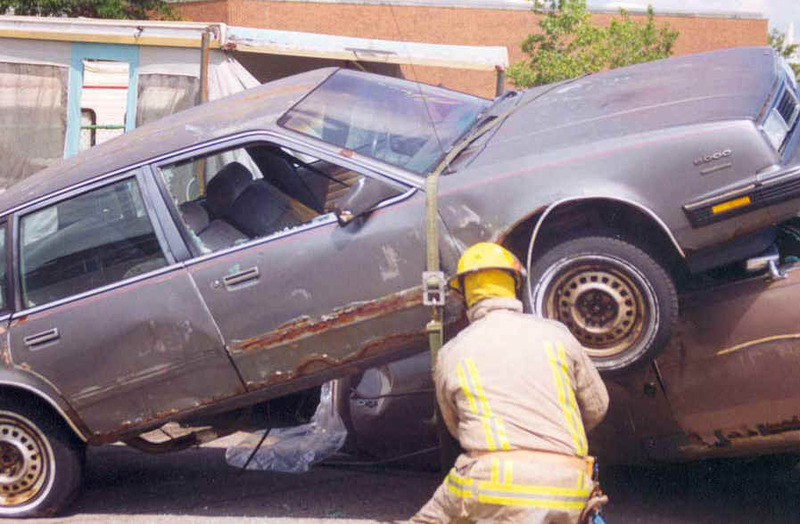 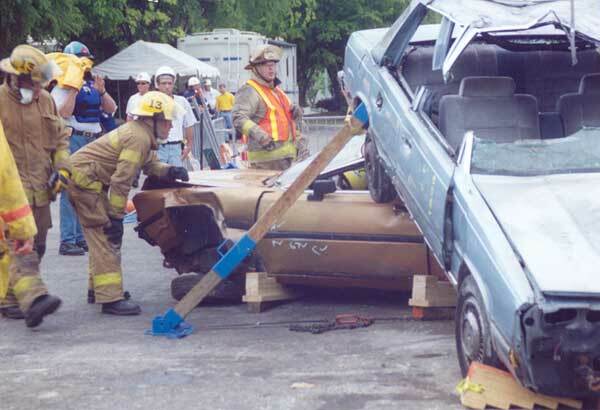 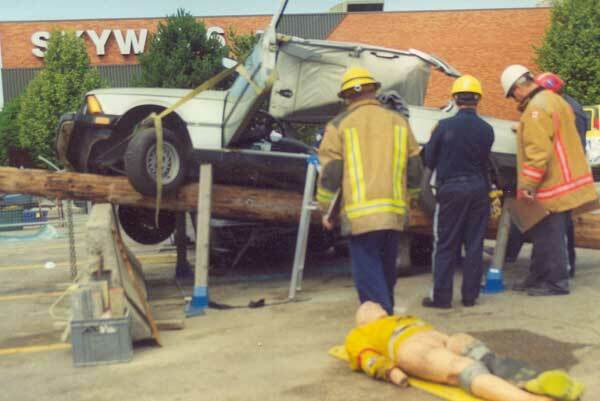 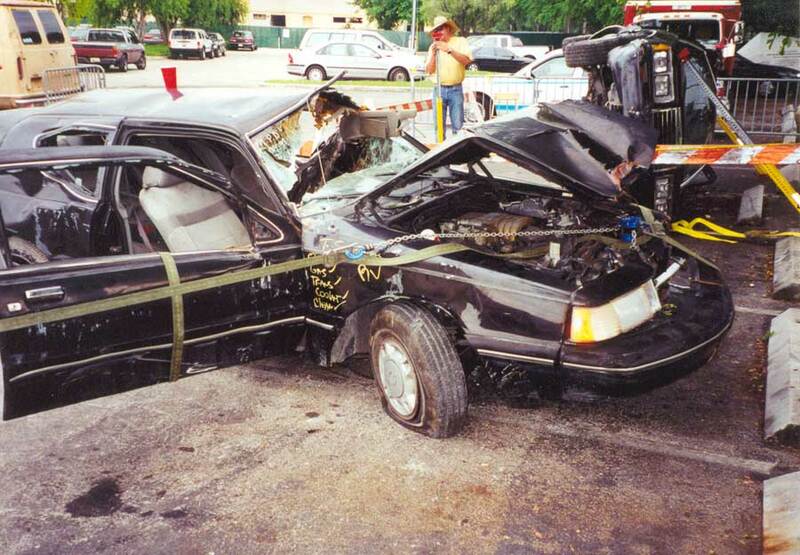 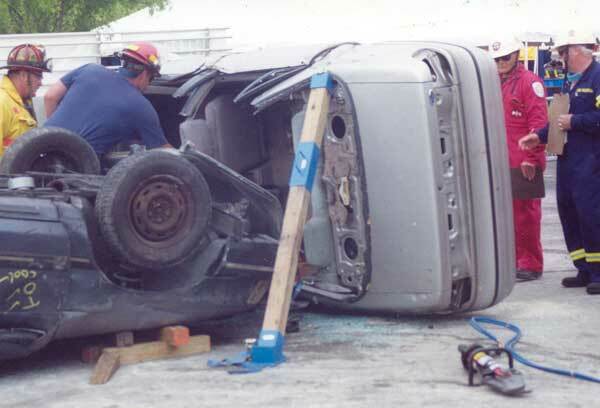 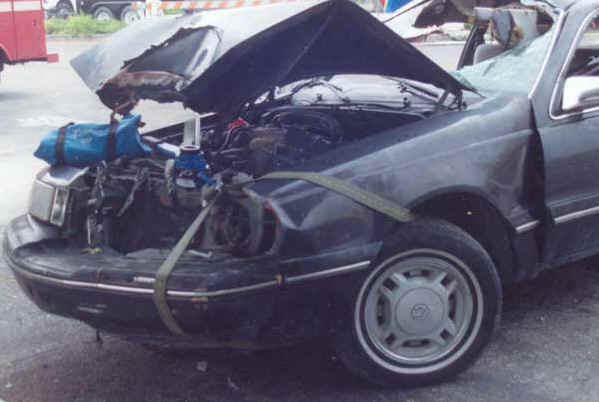 Scenario: A car is on it side, the victim is under the car, what do you do??? 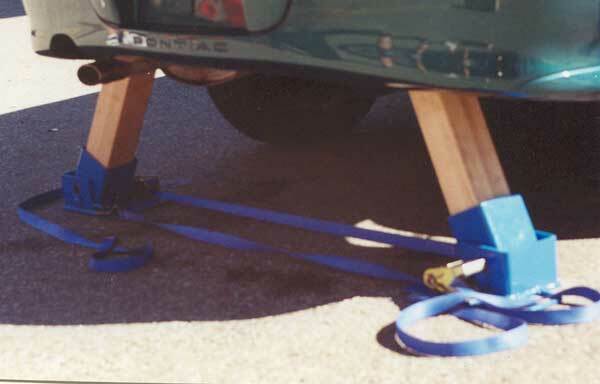 Use four (4) Ground Pads and the Cross strap, tool to tool with a controlled lift. 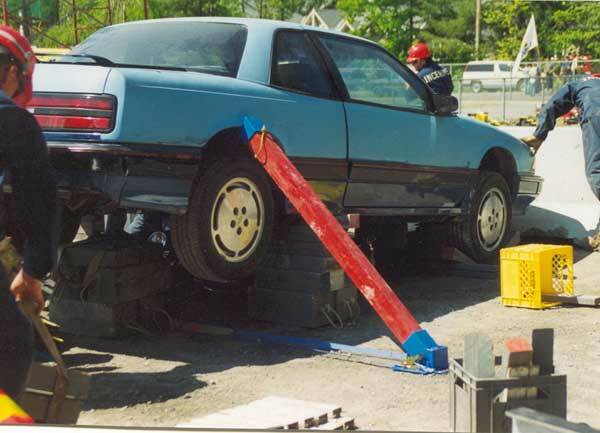 The car will remain rock solid, suspended 14 inches off of the ground. 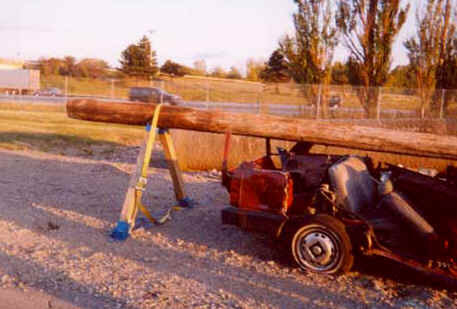 Thanks to Walley Byers and the International Champion Brighton Team for this GEM!! 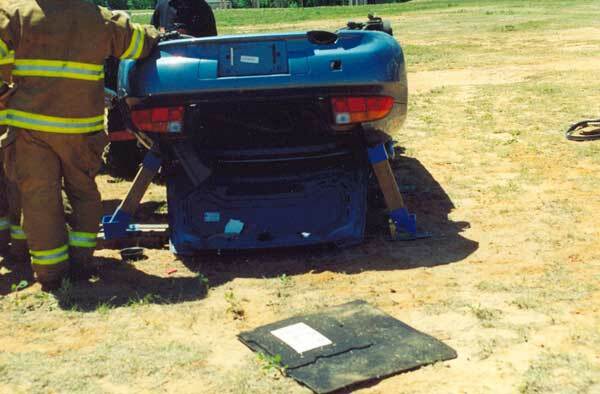 ZMAG© Products see many competitions, however this was the frist time this team ever saw the ZMAG© Ground Pads. 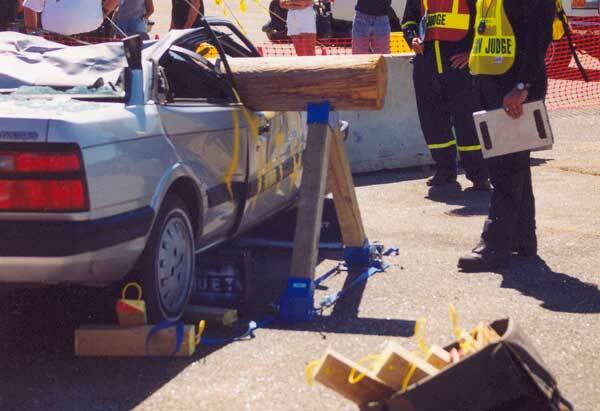 They used four (4) on this teetering BMW and had it rock solid in two (2) minutes. 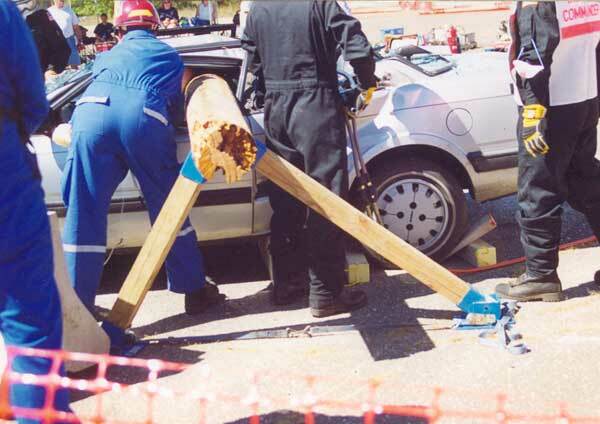 The team won Best Novice Team for this evolution. 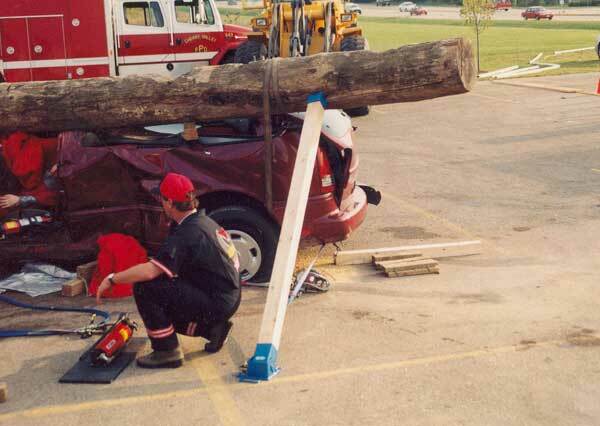 Shows just how simple and non-complicated the tools are!! 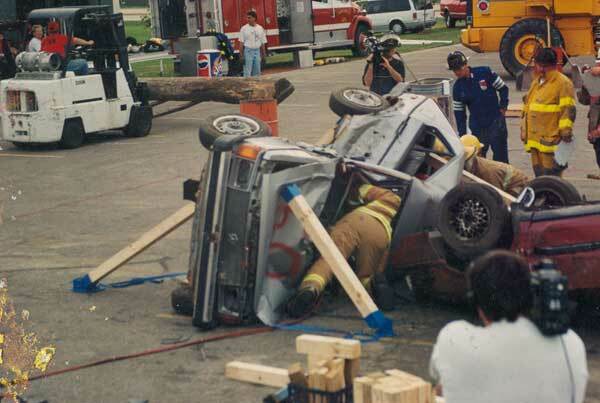 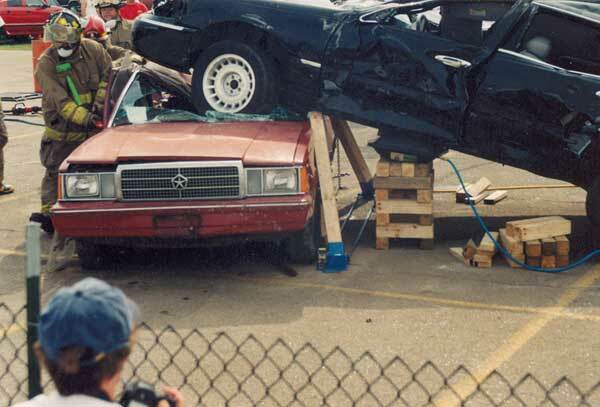 this trick at the "Fire House Expo" in 1999. 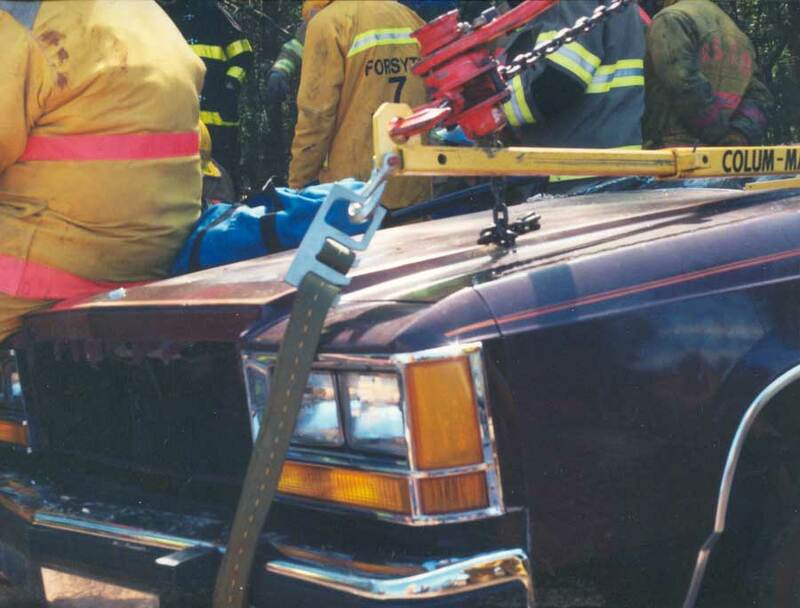 Peter Methner of Niagara Falls out doing a total Roof Removal in Halifax NS Canada . 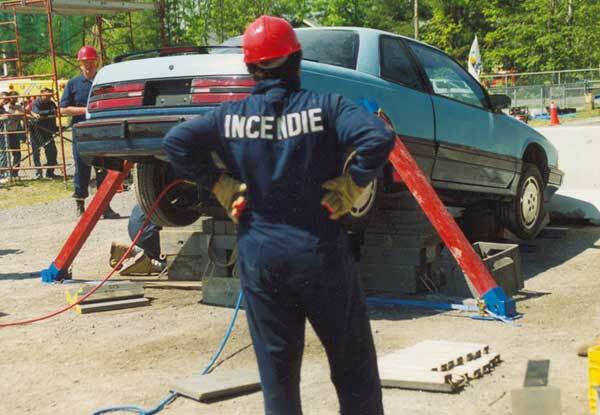 Override Brighton, NY Team competing at the International Competition in Rockford, IL. 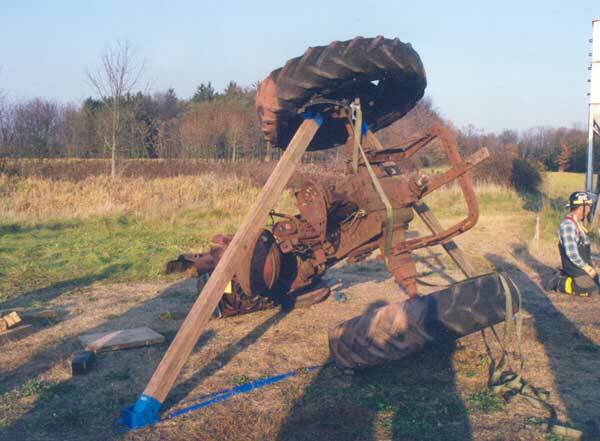 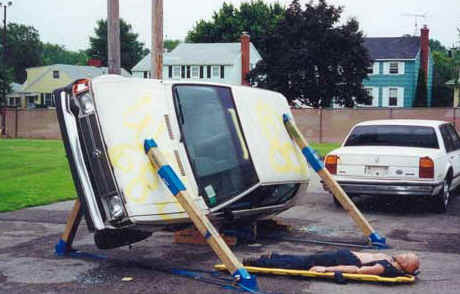 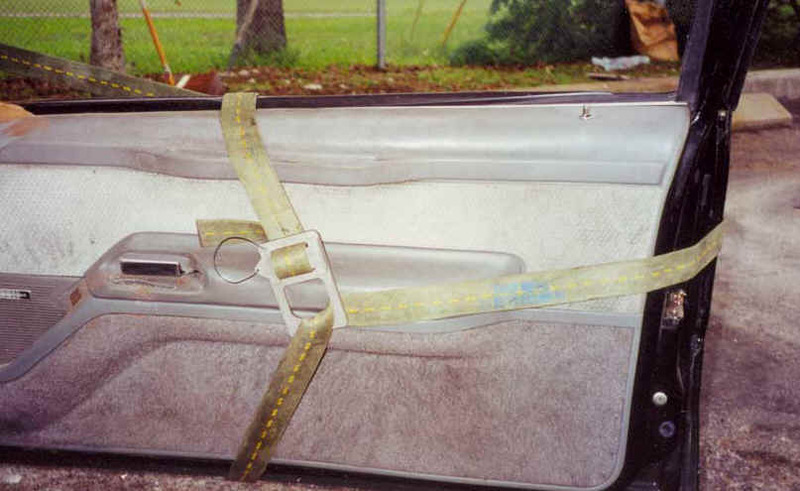 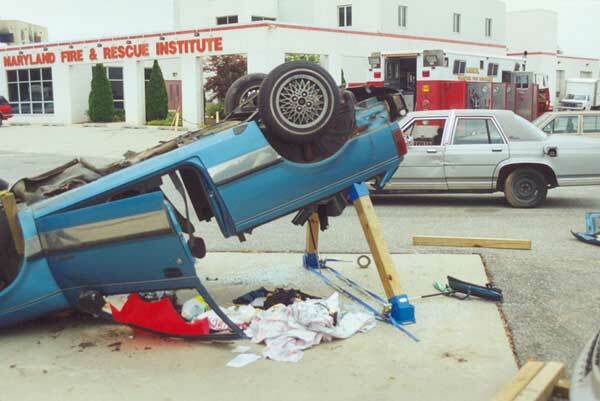 Can you carry enough Cribbing in your rig to "Lift an Inch, Crib an Inch" in this scenario??? 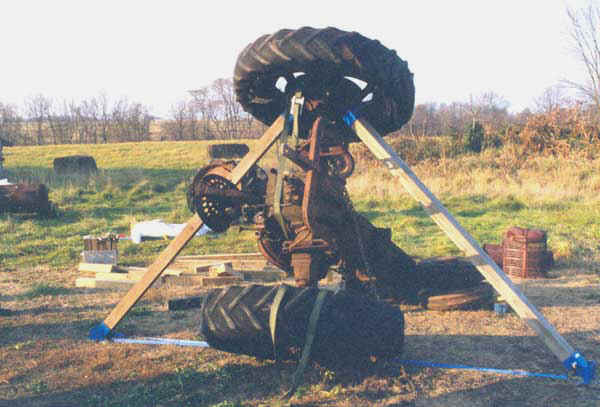 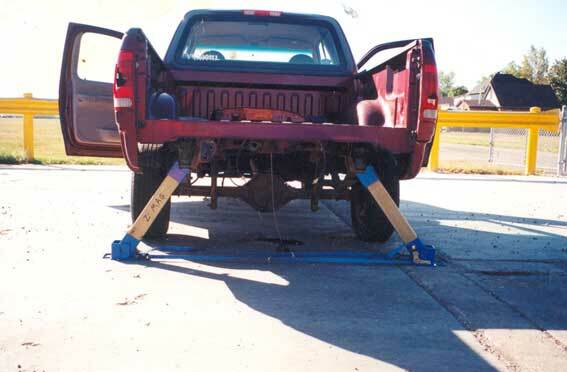 Ground Pads plus two (2) 4 x 4's safely and solidly follow your lift. 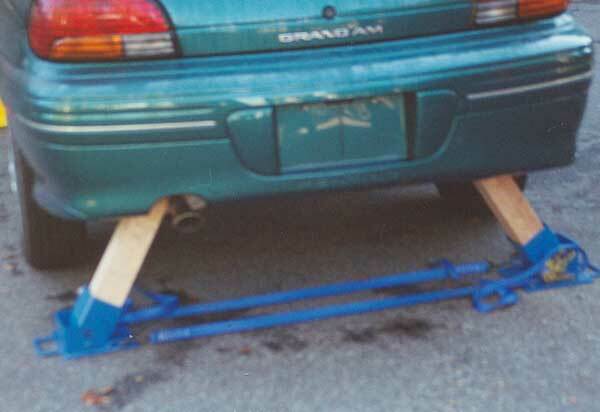 Simply ratchet the bases toward each other throughout the lift. 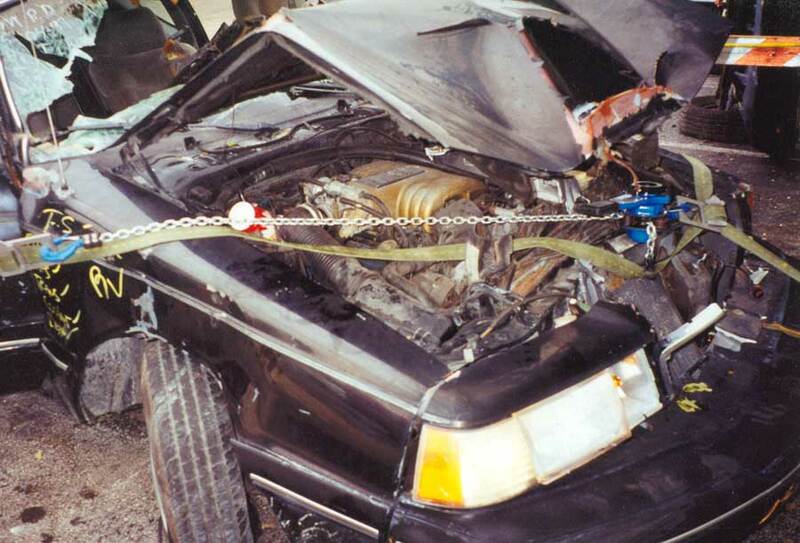 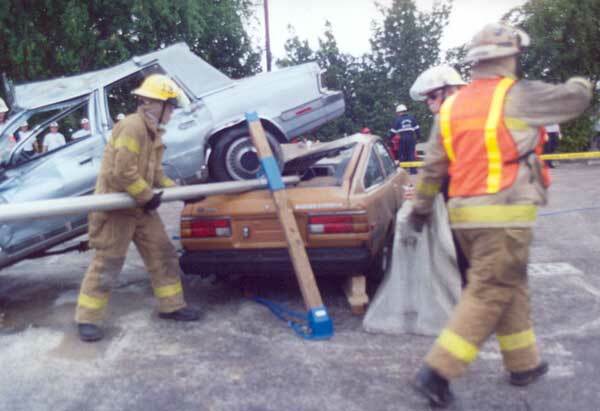 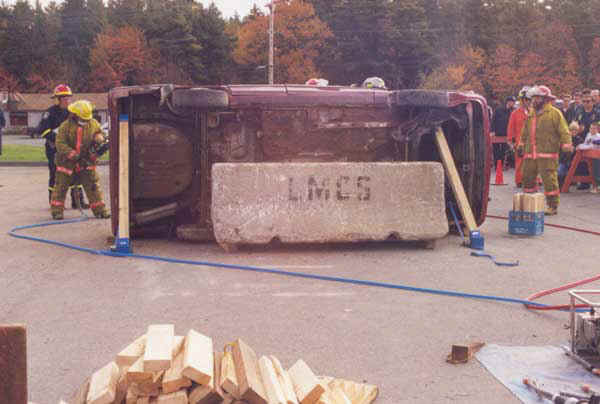 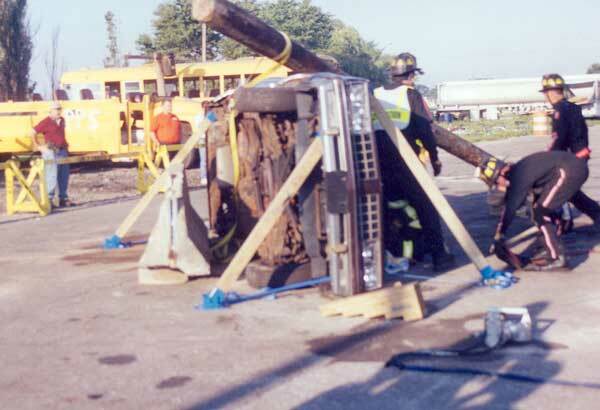 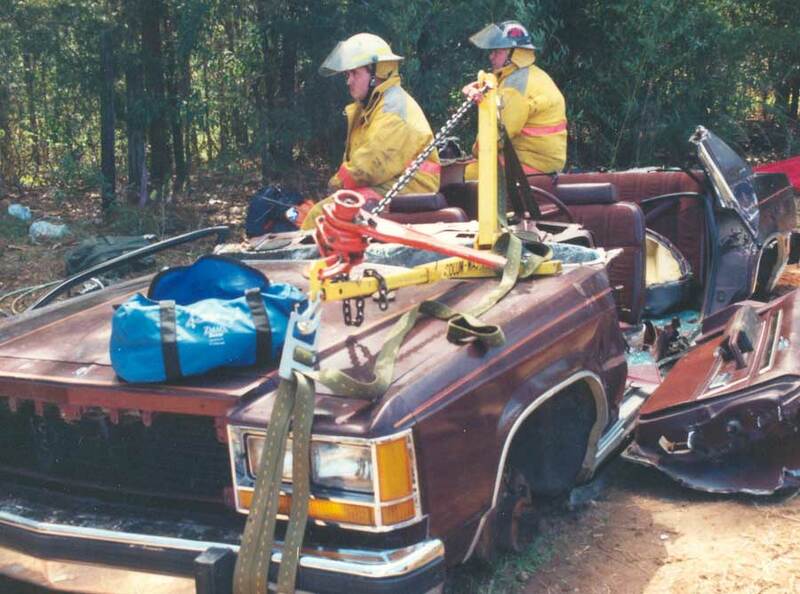 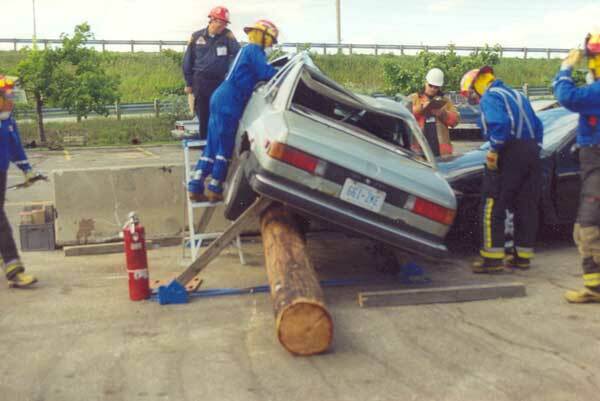 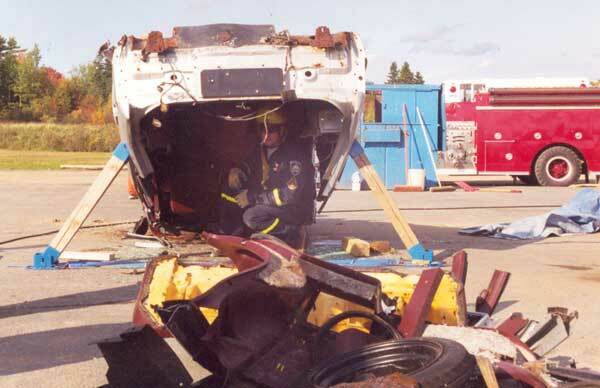 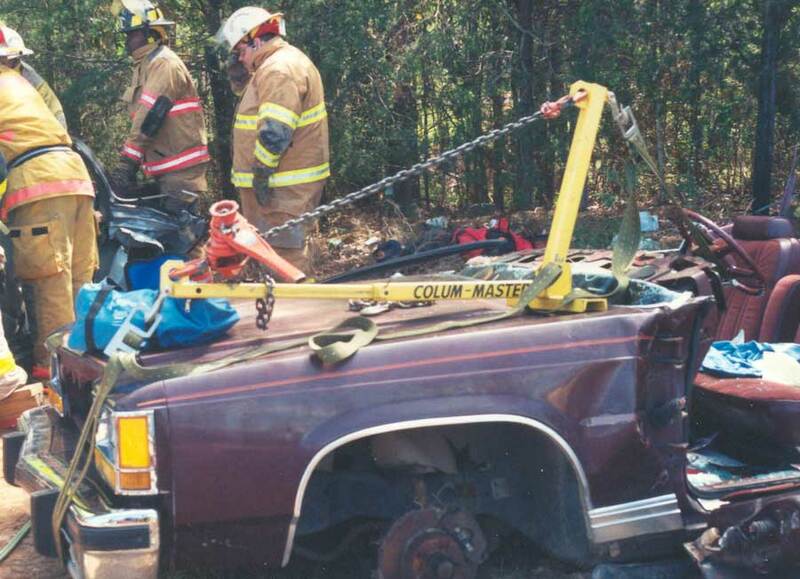 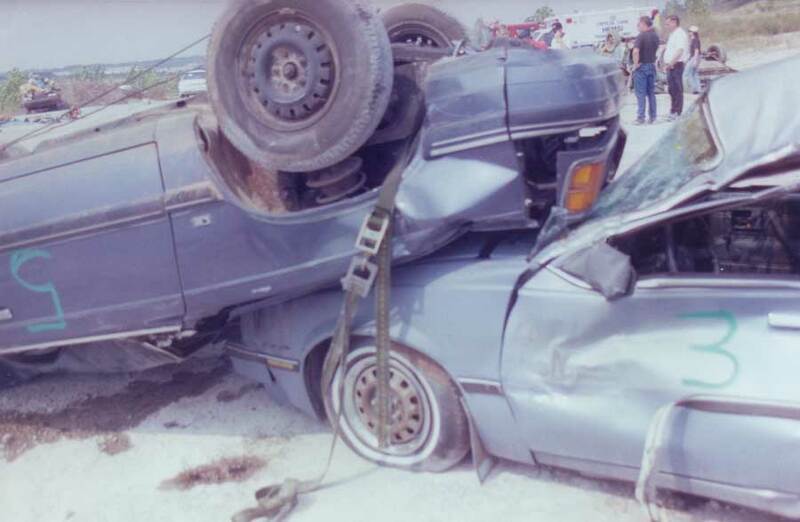 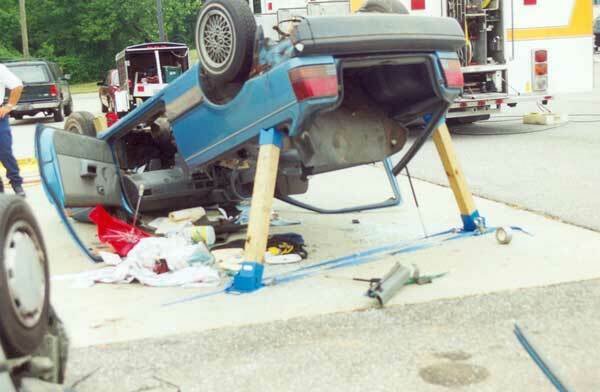 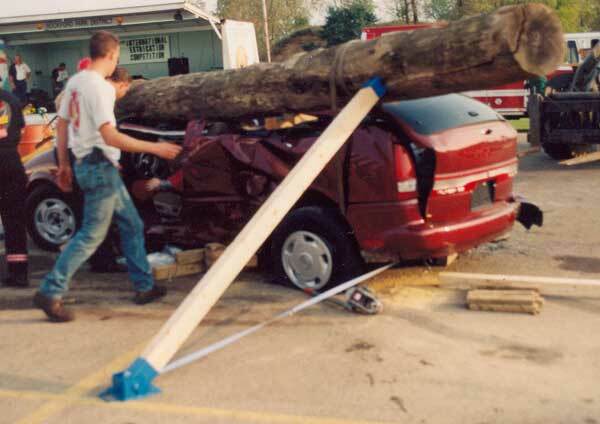 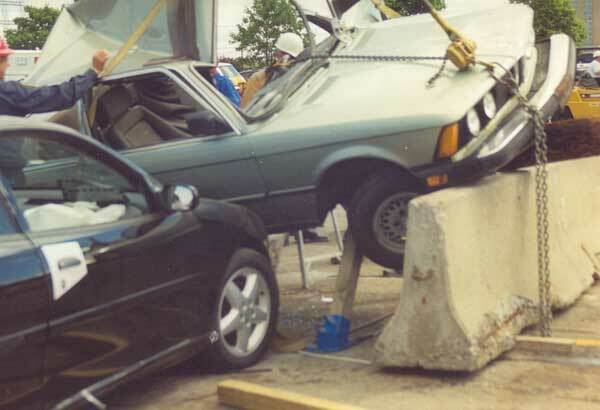 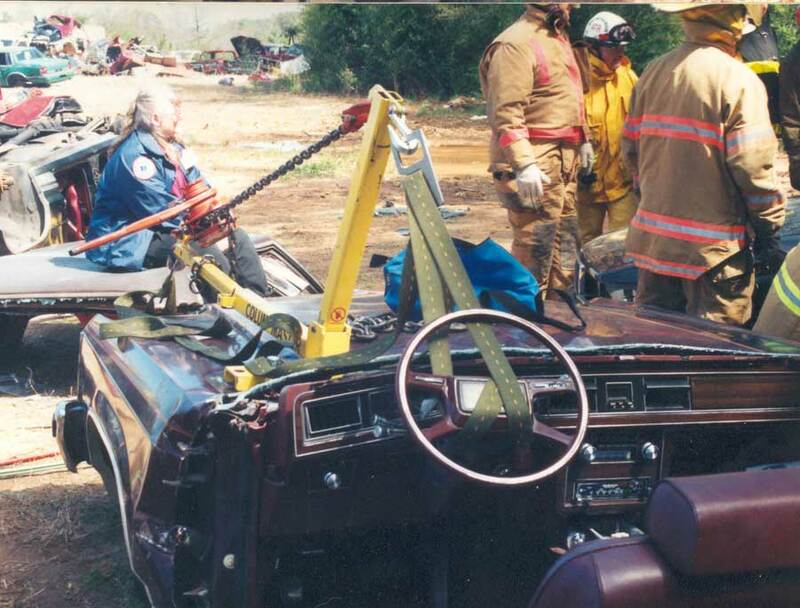 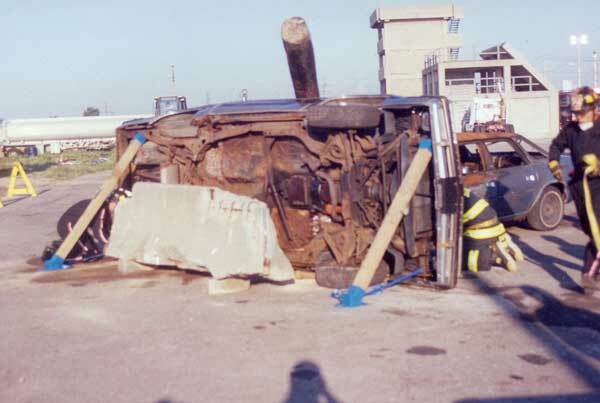 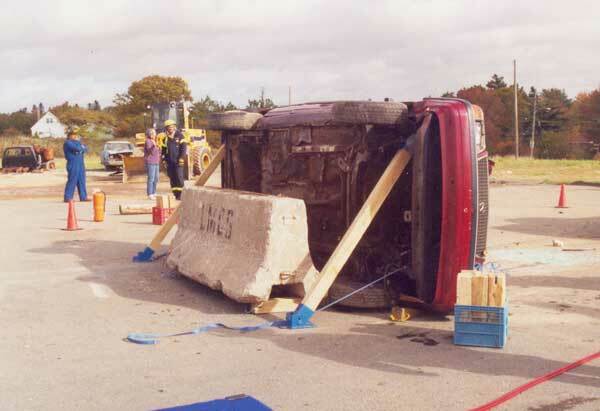 Mike Currey and The Brighton Extrication Team for developing this Pole Stabilization technique. 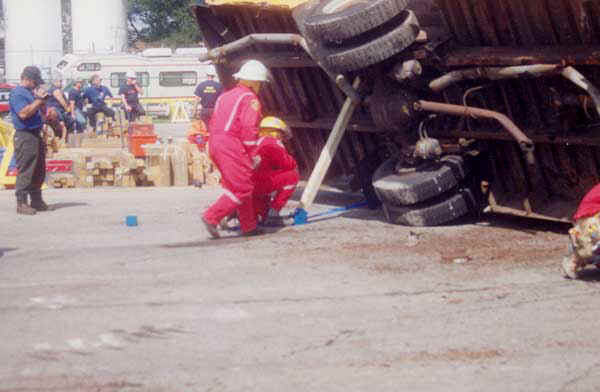 Scugoy Ontario Canada team attaching a SCHOOL BUS on it's side. 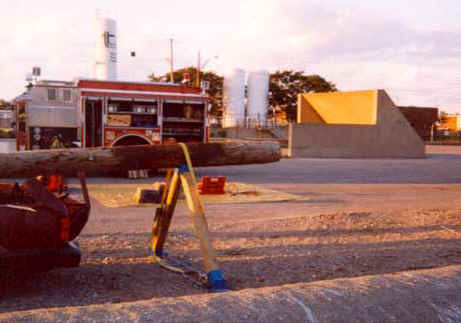 Scranton Fire Dept. 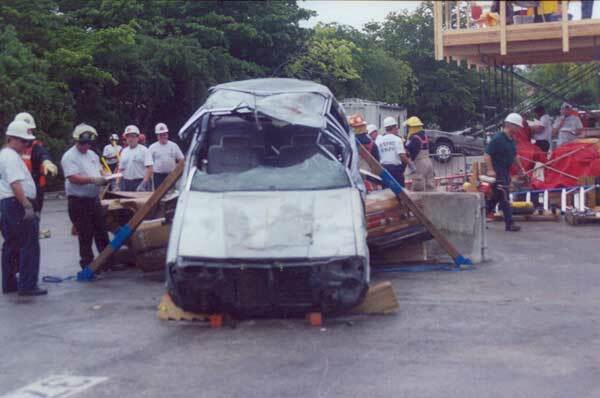 Competing in North East Regional Competition, Brighton, NY. 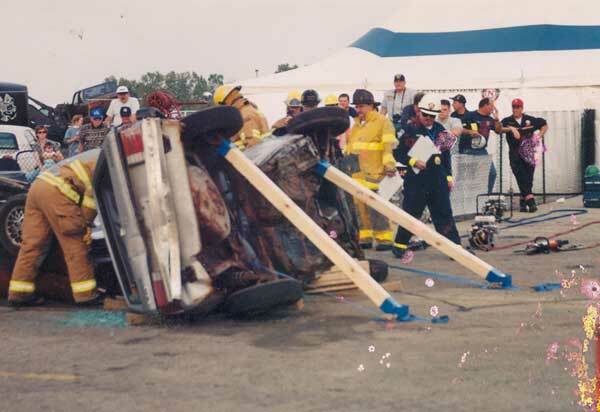 The man with the Clip Board is Captain Steve Kidd of CarBusters watching an excellent Ground Pad evaluation, International Competition in Rockford, IL. 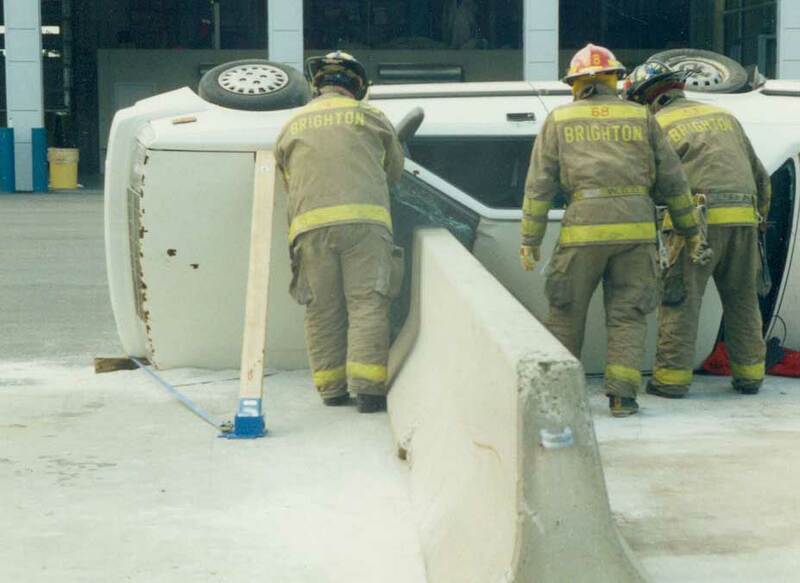 Shiny side or greasy side - no sweat for the "Brighton Boys". 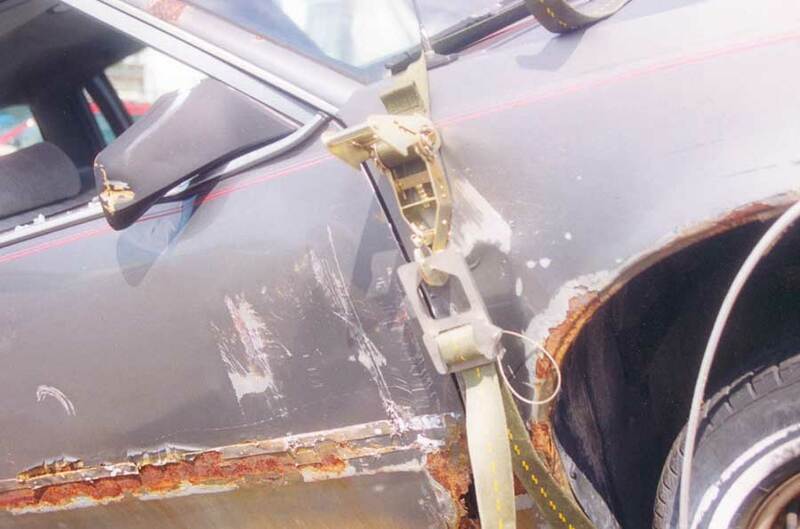 Avoid Plastic Bumpers and Rocker Panels! 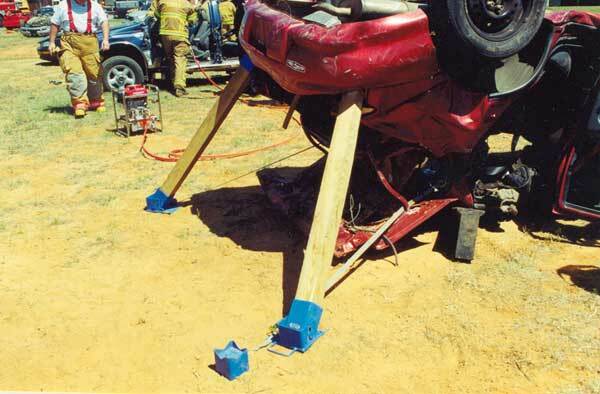 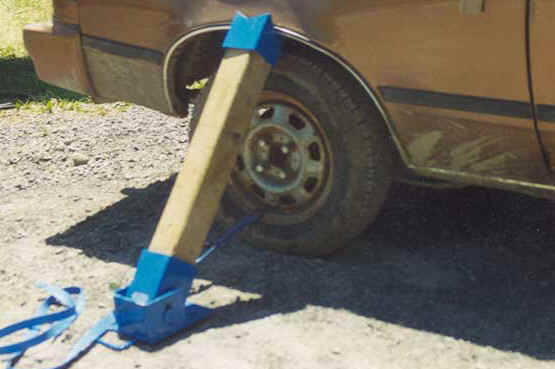 Other Options: Take 2-3' 4 x 4's and replace 36 pieces of cribbing solid and quick. 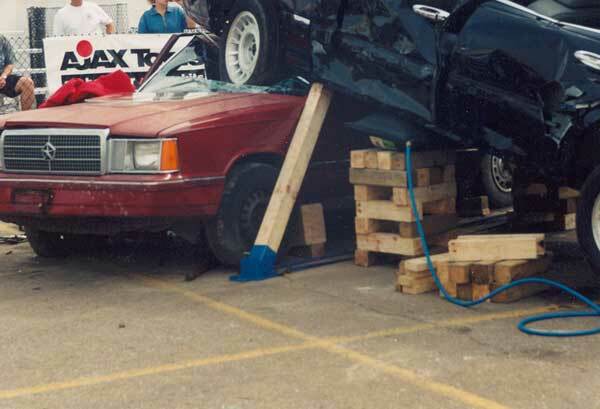 - Photo taken by Mark Uttley. 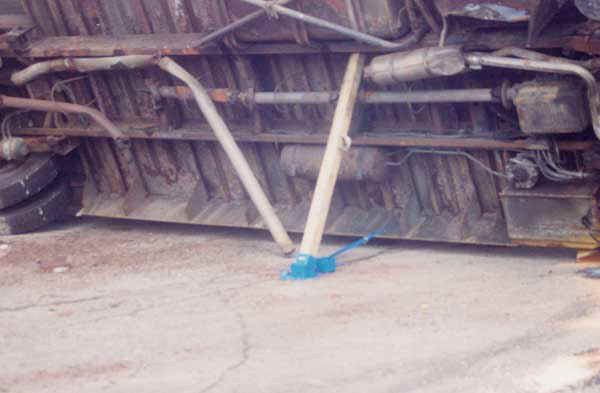 Marry the Z-Strap with an Override quick and easy.